Currently enjoying the recent displays of nlcs. This was the second time in a week of seeing them. Took photos around 1 am, which I spotted over this very old stone shed in the middle of a field. The shed serves as a stable for two young Shire Horses and thought it would make a good foreground to a lovely nlc display. the nlcs then quickly faded to the horizon. 350D SLR F4, EXP 15 secs ISO 400. 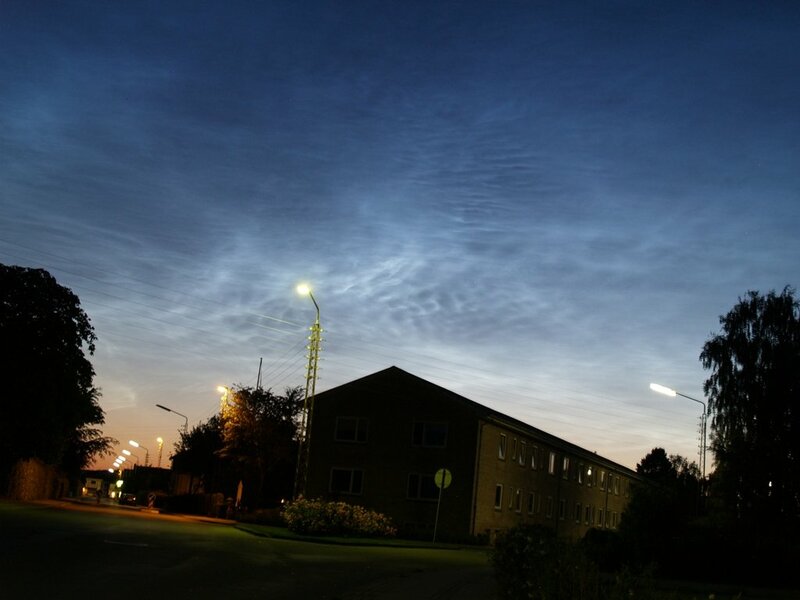 Again NLC over Moscow. Canon A710 IS digital camera on the tripod. IS0 200, panoramic image with exposition 6 sec. 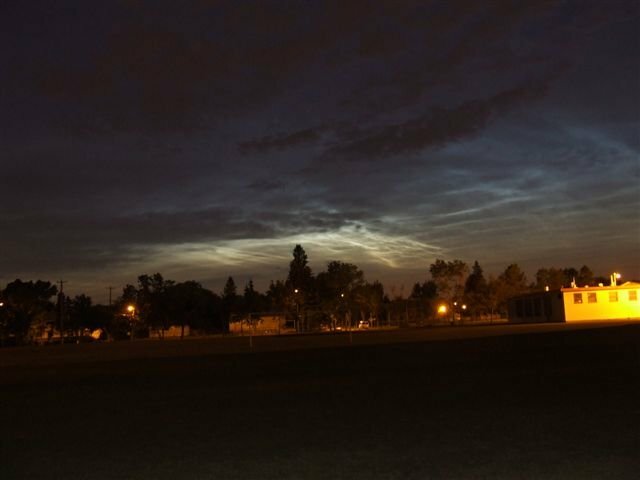 No truth to the rumour that there are no noctilucent clouds in Canada. After a slow start to the season, I have now observed displays on 8 different nights, including 6 of the last 7. Last night's display was bright in places, focussed in a 10 degree-wide brilliant quilt. 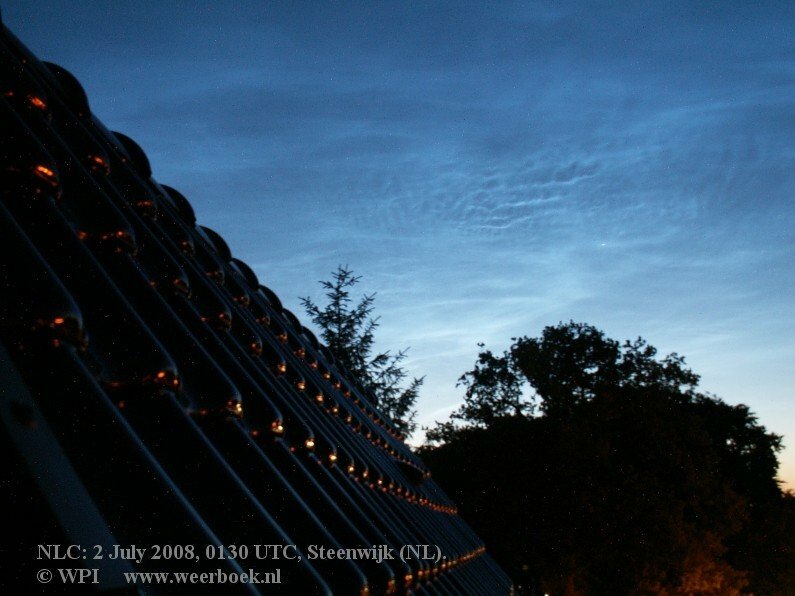 It had a spectacular latticework structure throughout the night, gradually becoming absolutely gargantuan in scope, ultimately covering pretty much the entire northern half of the sky, from E to W horizon, bright up to about 60 degrees altitude and (faintly) right up to the zenith. The southern half of the sky completely clear. 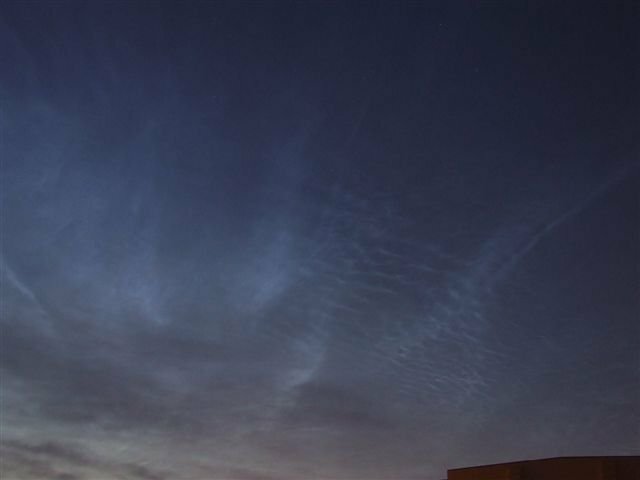 Weird thing about this display was that the NLC was alternately bright and dark, with billows of unlit clouds presumably hanging a bit too low to catch the sunlight. 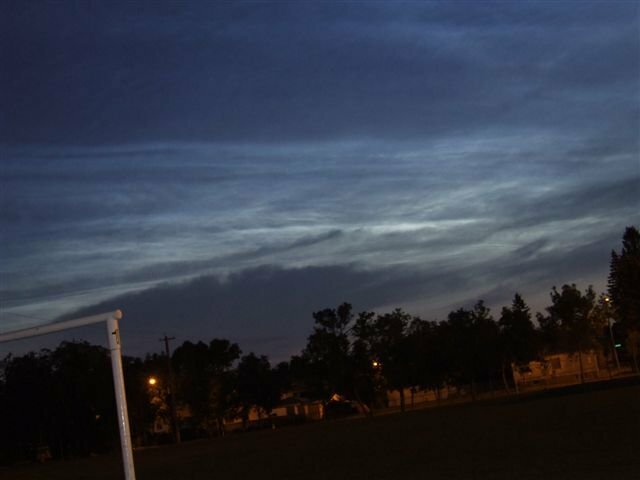 Rather than foreground tropospheric clouds these dark billows were clearly part of the same structure as the bright parallel bands that seemed to support them. I counted as many as 30 of these gently curving horizontal bands. Through these at pretty much right angles penetrated some still-brighter rays, which emanated from the NE and diverged in broad bands, some soaring high and others flattening out near the opposing horizons. The rays gradually diminished in brightness and petered out like the tail of a comet--where exactly?--crossing some vague threshold of resolution. One ray extended a full 60 degrees into the NW and had me drawing comparisons to Hyakutake. Photographs taken on the early morning of July 4th 2008, in Dronninglund, Denmark with an Olympus E-500, ASA 200, various shutter speeds, from 2 sec to 10 sec. The sky was illuminated even more than on July 2nd. Muc more "crab-like" structures, and very clear wavestuctures. 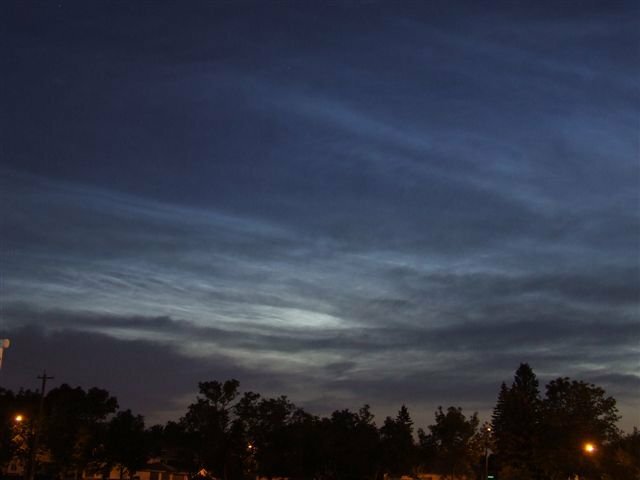 The NLCs spread out most of the horizon from east to west at 2.30 am, and at least 60 degrees above horizon. A beautiful display of nature, just as on July 2nd. Steenwijk, northern part of the Netherlands. 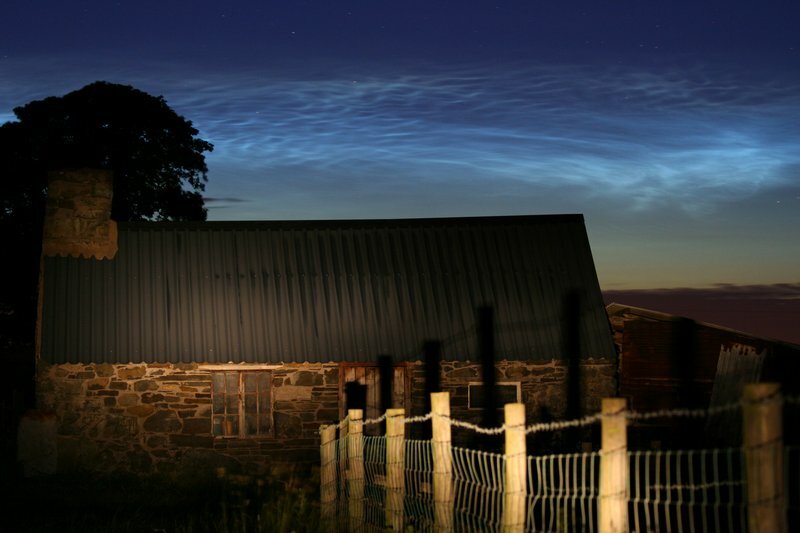 Astonishingly widespread NLC display! 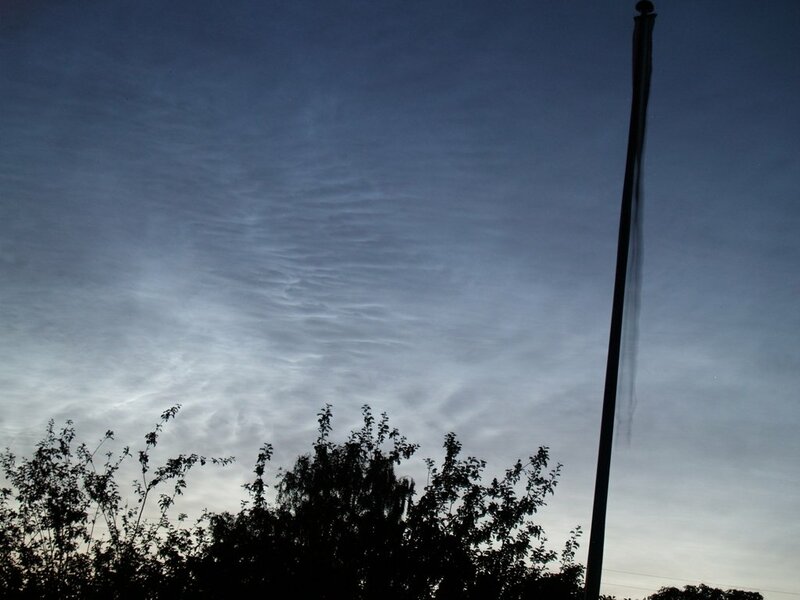 It’s the best NLC display of this season so far. Very bright and waving patterns were visible. Extremely rapid changing in form. A double wave structure above the northwesterly horizon changed so rapidly that even in a few seconds you could detect these changes of cloud structure. Another astonishing fact was the widespread character of this display. 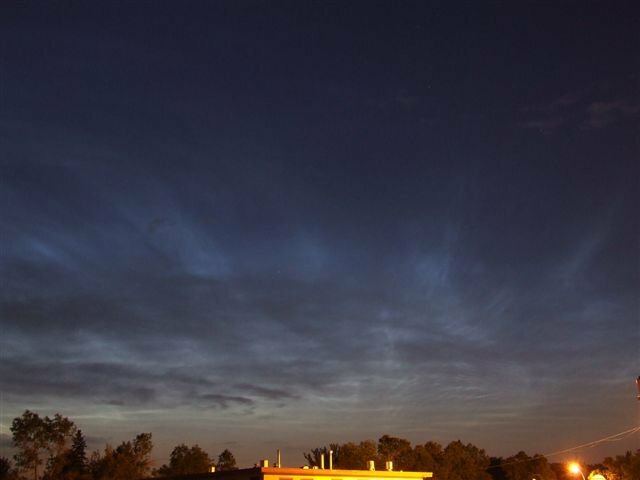 At 0130 UTC, almost 2 hours before sunrise the normal small band over the northern horizon contained visible NLC structures. Half an hour later it had spread already over the whole northern half of the visible sky. Again half an hour later, around 0230 UTC well-defined structures appeared in more and more blue sky in the southern parts of the sky. My last observation was around 0240 UTC (35 minutes before sunrise). 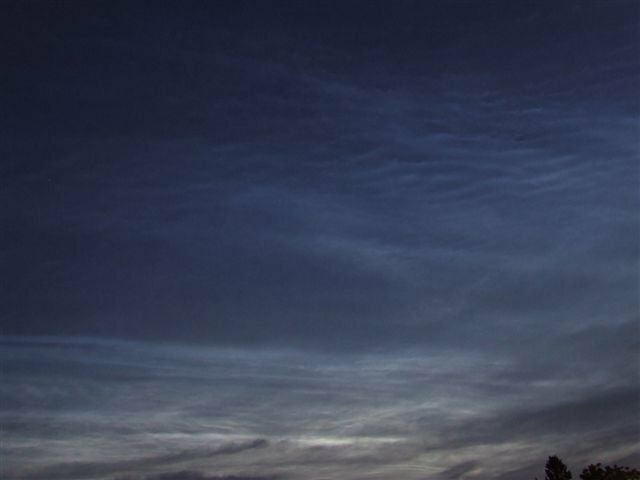 At that moment with the naked eye small NLC structures could be spotted 5 –10 degrees above the southsouthwestern horizon (one contrast enhanced image shows these clouds). 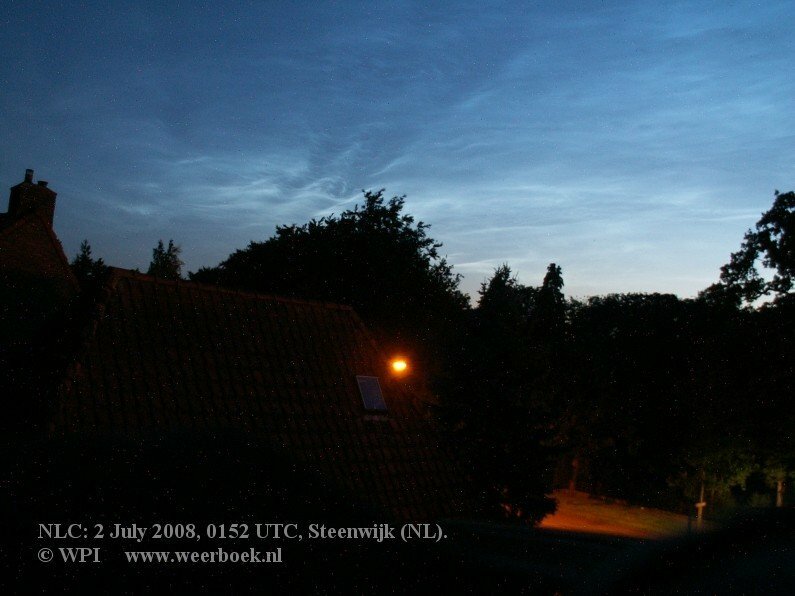 In fact this means that these cloud particles are drifting somewhere over the Belgian/French border, far south of the Netherlands. A few years ago I spotted NLC’s at 40 degrees height above the southern horizon, but never at a lower height in opposite sunrise direction. This case of July 2nd is my new record. 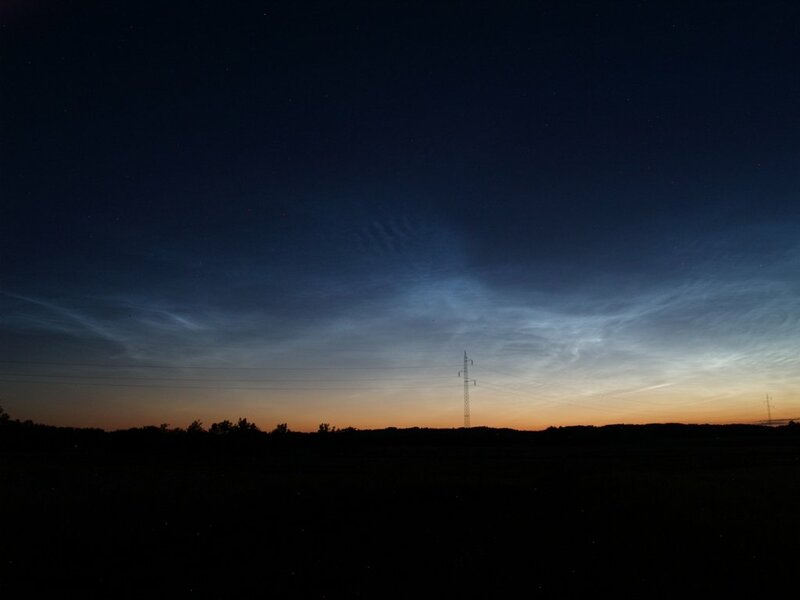 In fact this explains also the rare event that people in northern France have seen NLC’s so clearly at their very southern (NLC) latitude! Images taken with Minolta-Dimage Z3, exposure time 15 sec at 50 ASA initially, later 1,6 second 50 ASA.